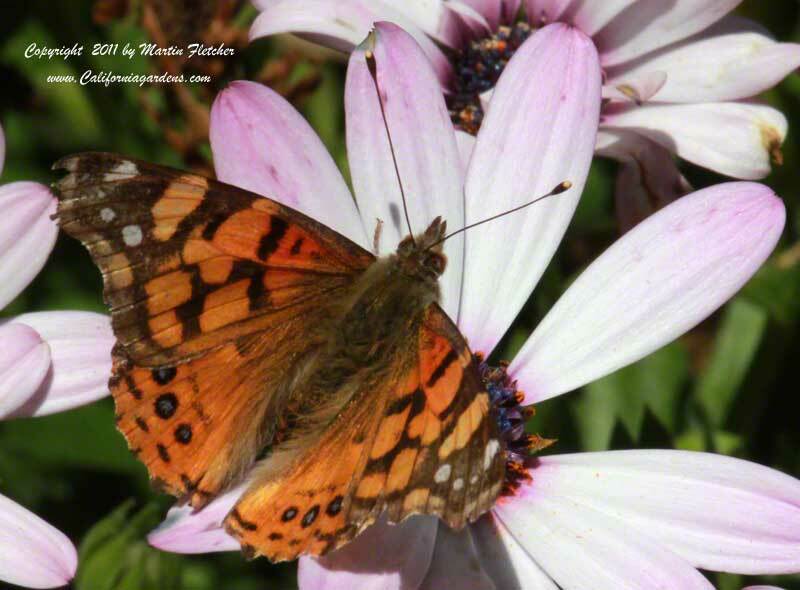 The Painted Lady Butterfly will rest on the ground or on flowers to get a drink of nectar to keep them going. Painted Lady Butterflies come into the yard's adjacent to weedy lots commonly in the Spring. They thrive on a wide variety of plant material including a number of plants in the hibiscus family and aster family, particularly thistles, hence the other common name for Vanessa cardui, Thistle Butterfly. One of the larger Genera of thistles is Carduus. Painted Lady Butterfly sipping nectar from a freeway daisy. High resolution photos are part of our garden image collection.